Free and fair polls, EC? The Election Commission of India sprung somewhat unexpectedly into action on Wednesday to stall the release of the biopic based on Narendra Modi’s life, after it had gotten the clearance from the Central Board of Film Certification. In the EC’s view, the release of the biopic would affect the “level playing field” for political parties. It can’t have gone amiss that the stated date of the release of the film was April 11 -- a date on which ostensibly parties are not supposed to be campaigning. The same order also apparently applies to the NaMo TV channel which mysteriously appeared on our DTH services without prior approval or permission, carrying endless coverage of Narendra Modi’s rallies and speeches. The unexpected nature of this action has to do with the fact that the EC’s performance as the arbiter of freedom and fairness in elections in India has been quite uneven thus far. While it has finally moved to ban the biopic, it has moved too slow or too little on the matters of divisive speeches by politicians, the use of government machinery by ruling party candidates, and till recently, NaMo TV. While a full assessment of the EC’s role in the 2019 elections should wait for the process to be complete (without being dependent only on the outcome), nonetheless its actions so far have been a source of much confusion and derision in some quarters. Has the EC been sleeping on the job? Has it reached the limits of its powers in the face of a political party with seemingly unlimited funds and willingness to cast all norms to the wind? Or is it trying to carry out an impossible and unenviable job knowing it can never please everyone? In understanding the EC’s functioning so far, it helps to understand the legal framework within which it operates. The source of the EC’s powers is Article 324 of the Constitution -- the ultimate astra in its arsenal and one which is most invoked when it takes action. This Article gives the EC the “superintendence, direction and control” of preparing the electoral rolls and holding elections in India at the state and central levels. It is the kind of power that is not available to any other authority in India in any other context (save for the Union government during an Emergency). It effectively gives the EC power to intervene in any situation during elections so long as it is not contravening existing laws and the Constitution in doing so. It is true that the full scope of this power was not properly exercised until the time of Chief Election Commissioner TN Seshan, but theoretically, the EC can do anything necessary to ensure a free and fair election. 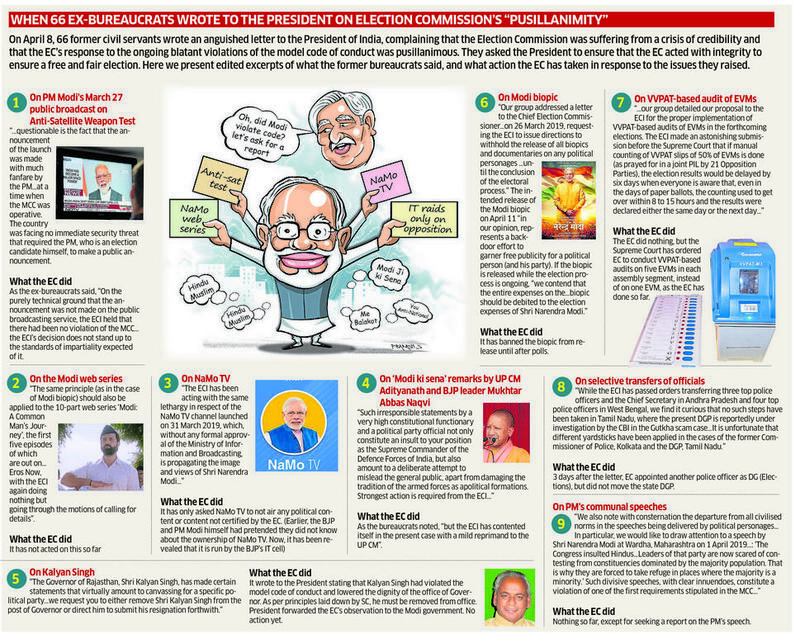 Seen from this perspective, it seems surprising that it took much public anger and anguish before the EC could be spurred into action against the Modi biopic and NaMo TV. While it’s understandable that it waited for the CBFC to issue a certificate before acting for the former, it is mystifying why it waited for weeks to act on the latter, especially when there was nothing on record to show its legality in the slightest. More so, by the EC’s own admission that these two did tilt the level playing field in favour of one party. The one limit to this power is that it cannot be exercised contrary to the Constitution and the laws. Obviously, the EC cannot imprison someone under this provision or disqualify a candidate since these powers can only be exercised by a court of law after due procedure. In that sense, it is understandable that the EC cannot immediately crack down on divisive speeches by candidates. It can, at best, warn and reprimand but it cannot censor or entirely silence them. On this front, it is appropriate to blame courts which have failed to convict politicians in time for hate speech or disqualify those who made such appeals from public office. There are, however, dangers to letting the EC run completely rampant with its powers during elections. It is a legitimate question as to whether the EC’s admittedly temporary ban on the Modi biopic is a reasonable restriction on free speech in accordance with Article 19 of the Constitution. While the EC has been careful to state its reasons in a detailed order, and includes films on other politicians’ lives as well, there is a real danger that an over-zealous EC might end up being (yet another) threat to free speech in India, if it chooses to extend this approach to other media as well. This is where a regime such as the Model Code of Conduct comes into the picture. This sets out a clear standard for political parties and their agents on what they can and cannot do. It also allows for voluntary compliance on the part of third parties such as social media networks and newspapers. While it has no legal binding force per se, it is the basis for taking legal action under the relevant legislation. While the EC may issue directions in specific cases, it cannot possibly hope to try and regulate newspapers and social media without getting bogged down in the minutiae and endless legal battles over enforcement. There is, however, one thing that the EC can do nothing much about -- the black money funding of elections through Electoral Bonds. While the EC, with police and income tax authorities, can try and stop the movement of cash during the time of elections, it can do nothing about political parties amassing a war chest of money to be used as and when needed. More so when one party seems to have almost all the money being donated for political purposes. To its credit, the EC has put its objections to electoral bonds on affidavit in the SC, with the hope that the SC will ensure full transparency in funding. The SC, however, has allowed the Electoral Bonds scheme to continue for now, only requiring parties to reveal the details of the donations received through it to the Election Commission in a sealed cover. Whichever way you look at it, the EC has a near-impossible and unenviable job -- of not only organising elections in a diverse and vast nation of 900 million voters, but also ensuring that the entire process is free and fair. The regularity with which incumbents are voted out at all levels and the turnouts indicate that they have, to a large extent, succeeded. That doesn’t mean that we should stop expecting them to do more and do better.